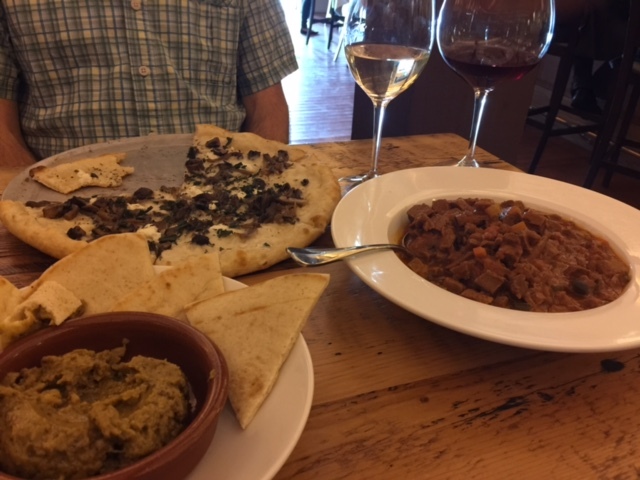 Whether you are vegan, vegan-curious or just interested in eating healthfully more often, my goal for the blog is to share my Napa Valley vegan experiences with you. I want every restaurant in the Valley to offer at least one vegan appetizer, entrée and dessert so everyone can enjoy their experience here in Napa Valley. Based on the fact that almost all parts of the U.S. are embracing the plant-based lifestyle, I have been very surprised by how disinterested many of the local chefs have been at making this small change to their attitudes and menus. I don’t believe at this stage there is a large enough demand in Napa Valley to warrant a 100% vegan restaurant. But with the huge influx of tourists from around the world and the local North Bay vegans, the importance of the Napa Valley chefs opening their minds and restaurants to plant-based diners is vital. 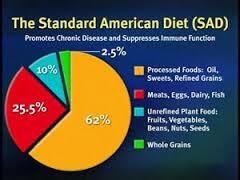 Not only does the vegan population continue to grow but the facts on how unhealthy our Standard American Diet is continues to make headlines and influence our dining choices! 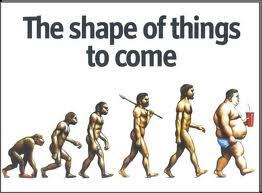 Since beginning my blog about 9 months ago as many times as I have been disappointed by some chef’s disinterest in offering healthy and compassionate options, I have also been really impressed by a few chef’s openness to dialogue and willingness to embrace change! 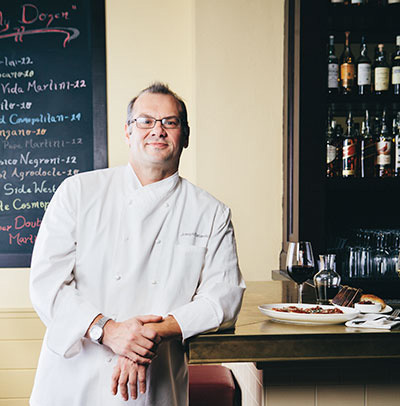 In fact, one chef in particular has surged ahead of the others in welcoming us vegans into his restaurant – Joe Panarello, Executive Chef at City Winery Napa. I met Chef Panarello several weeks ago after hearing through the grapevine (no pun intended) about his vegan-friendly City Winery menu. My husband and I finally had a free afternoon and decided to stop in for a quick drink and a small bites plate or 2. It was after 3 p.m., so we were between the lunch menu and dinner menu so really had no idea what to expect. We were lucky enough to have landed just in time to enjoy their happy hour from 3 – 5 p.m. City Winery calls it “Crush Hour” and offers 50% off their small bites and tap bar menus. 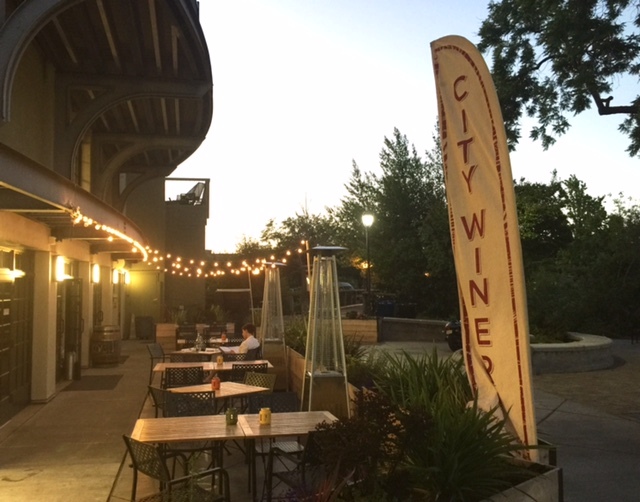 In addition to the “bar food” discounts they also offer 2 – for – 1 on all City Winery wines, brews and well cocktails. We explained to our server Bevin that we were vegan and she suggested their City Winery wine “on tap”. 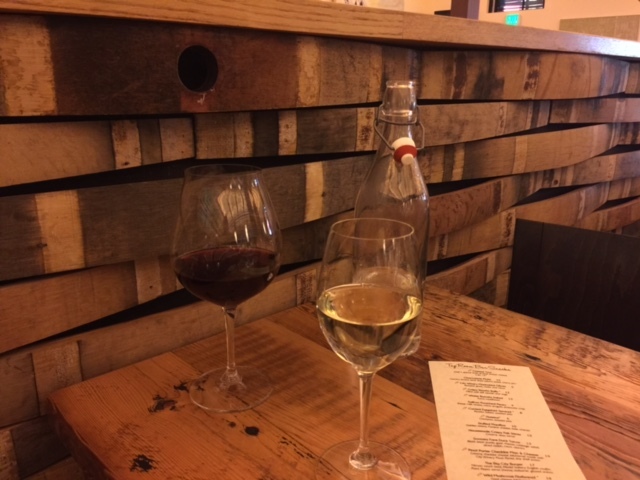 I enjoyed a 2013 Sauvignon Blanc and my husband sipped the City Winery 2014 Pinot Noir both by winemaker David Lecomte. We discussed the options available and Bevin suggested their Curried Eggplant Spread with roasted pita. And to our surprise, Bevin mentioned to Chef Panarello that there were a couple vegans in the bar and he came out to chat with us for a bit. He was really open and accessible and very interested in talking to us about our food choices, being a part of my blog and possibly joining me on my monthly Tout Suite episode. We exchanged information, he went back to work and Steve and I went back to enjoying our wine and bites. The next lovely surprise was when he sent out a big batch of his delicious vegan tofu sloppy joes. Needless to say we very much enjoyed our experience! As busy as Chef Panarello is, we stayed in touch and he was gracious enough to invite my husband and I back out to City Winery to sample his new menu launch! The staff was friendly, welcoming and offered us incredible service. We dined outside on the cozy patio overlooking the Napa River. There were two events going on inside while we dined so we had the entire patio to ourselves. We were also really excited that Bevin was our server once again. She explained that Joe had prepared a special vegan experience just for us, that there were several courses and that our entrée was a surprise. Boy, did we feel special! She brought us a half carafe of their vegan Pinot Noir and then the feasting began! 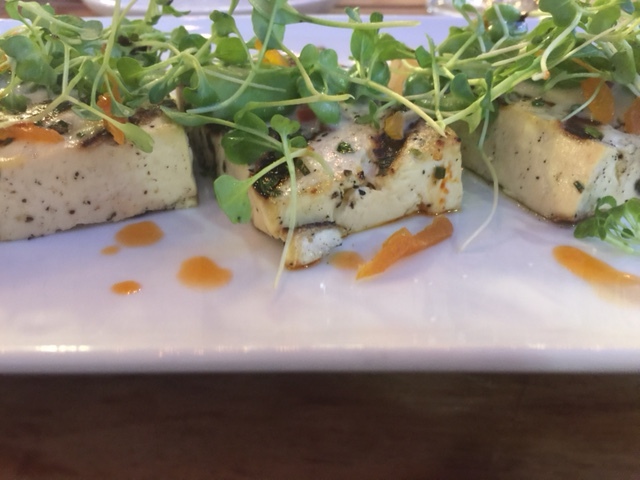 Our first course was the Grilled Tofu topped with local fava bean salad and tiny spring greens. The first thing I noticed was the amazing flavor and texture of the tofu. It was incredibly flavorful and wasn’t soft or mushy. It was one of the best tofu dishes I’ve ever had. Just incredible! The second course was the Baby Gold Beet & Blood Orange salad. 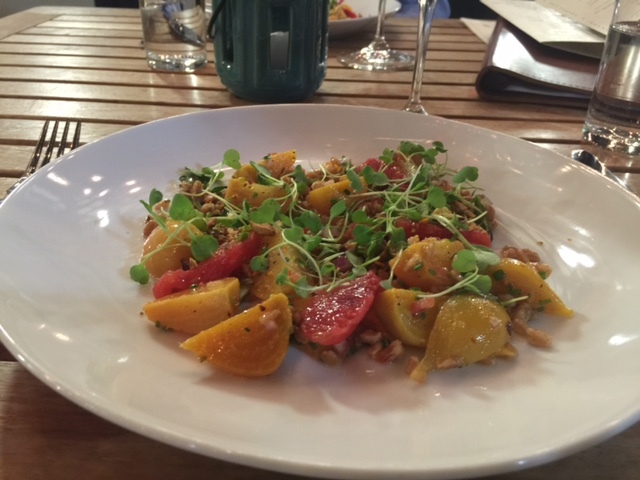 Large chunks of delicious beets, pieces of sweet orange sprinkled with toasted pistachios, and farro grains tossed with a tarragon vinaigrette. As amazing as the food was, I knew that I was going to have to pace myself to be able to enjoy each course! Throughout this gastronomic experience, Joe also came out to explain the food he had so artistically prepared for us. Did I mention that he and his team made us feel very welcome!? 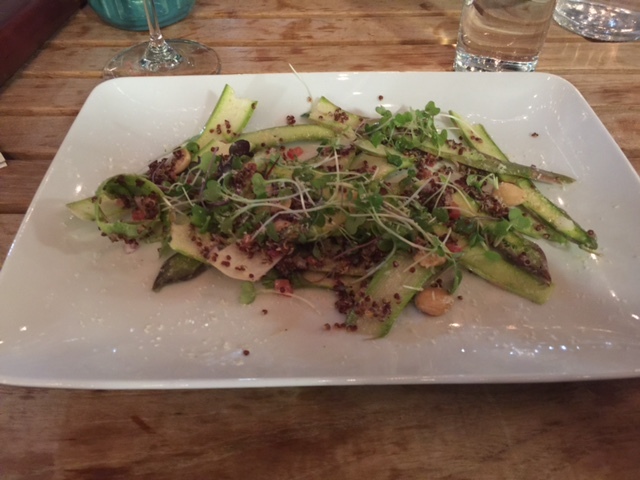 Course number 3 included two more of his salads – the peppery arugula salad paired with sliced apples, candied walnuts and apple rosemary vinaigrette and the local asparagus salad sprinkled with herbs, almonds and red quinoa. Just incredible. I have a hard time deciding which I loved more. 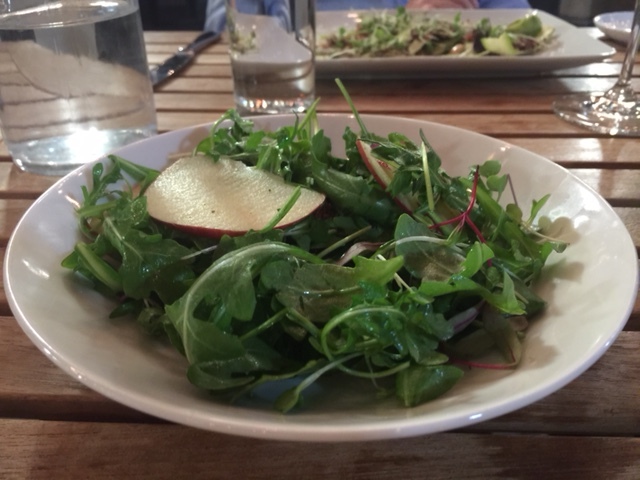 The apples and the hint of rosemary in the arugula heightened my sense of taste and smell and the shaved asparagus and almond combination were just wonderful! Bevin then announced that the entrée was on its way. Joe served our entrée and it was a true work of culinary art. 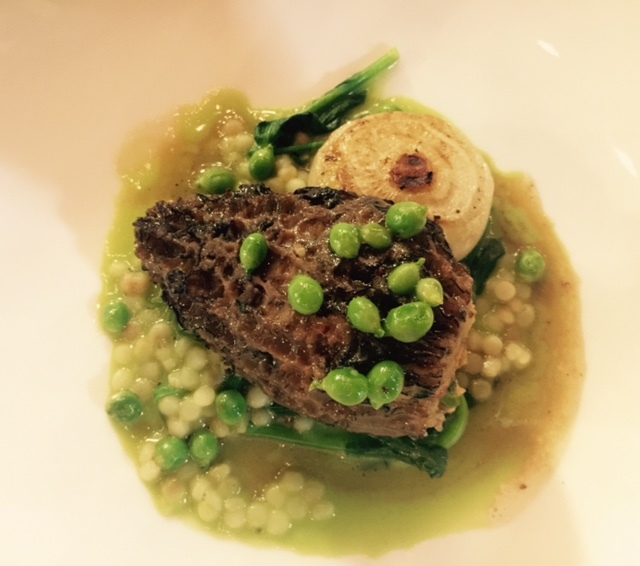 A large, fresh morel mushroom stuffed with pureed chickpeas, topped with couscous, next to a sweet grilled onion and drizzled with sweet pea sauce with a hint of hazelnut. I am reliving the experience as I type. 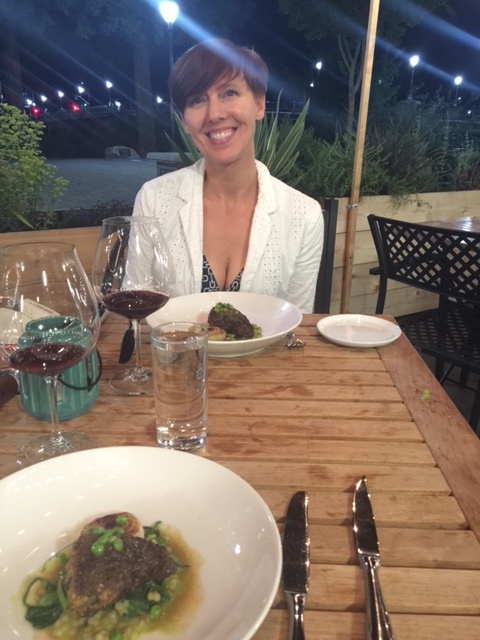 This is easily one of the best meals I have ever enjoyed and the morel entrée and grilled tofu are in my top 10 best meals ever! All of the salads are available on the menu but Joe will create a special entrée for you based on what delicacies he has in the kitchen that evening! Can you tell I’m happy with my meal?! And when I did not think he could out do himself, here came the dessert! 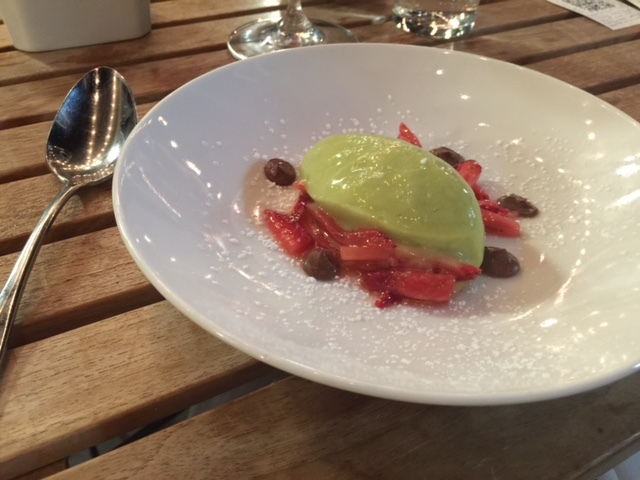 A refreshing and delicious avocado lime sorbet surrounded by macerated strawberries and several dollops of chocolate tofu with a sprinkle of powdered sugar. Steve and I agreed that neither of us would ever think of teaming avocado and lime together as a dessert. And we both agreed that is what separates a good chef from a great chef. It was a true work of art! Every course of this meal was a perfectly executed experience. Steve had a cup of coffee with his dessert and that was amazing too. I’m sure I sound like I am gushing but it was truly one of the most wonderful dining experiences I have ever had. Joe Panarello began cooking when he was only 12 years old at his family owned New Jersey restaurant. This early experience began his lifelong love affair with creating masterpieces with food. His passion includes visiting local food markets and choosing the freshest produce. His dishes are elegant and sophisticated but not pretentious; a true culinary experience. The last three decades of Joe’s career have been highlighted by some of the most acclaimed kitchens across the country including The Four Seasons and The Ritz-Carlton. As a rising star, Joe mentored with Chef David Burke at the Venetian Hotel in Las Vegas. More recently he worked as the Chef de Cuisine under celebrity Chef John Sedlar from the award-winning Rivera in downtown Los Angeles. You may have even seen him on an episode of Iron Chef America in 2009! Though he learned from an older generation of chefs, his cooking techniques are a mix between modern and classical. His outlook on service is extraordinary and I can vouch for the fact that his food is wholesome and simple yet refined and delicious! The original City Winery opened in New York City and was the only winery in New York City! They have expanded to Chicago, Nashville and Napa and continue to grow. City Winery Napa is located in the Historic Napa Valley Opera House at 1030 Main Street in downtown Napa. The restaurant seats 75 people indoors and the patio seats another 40. 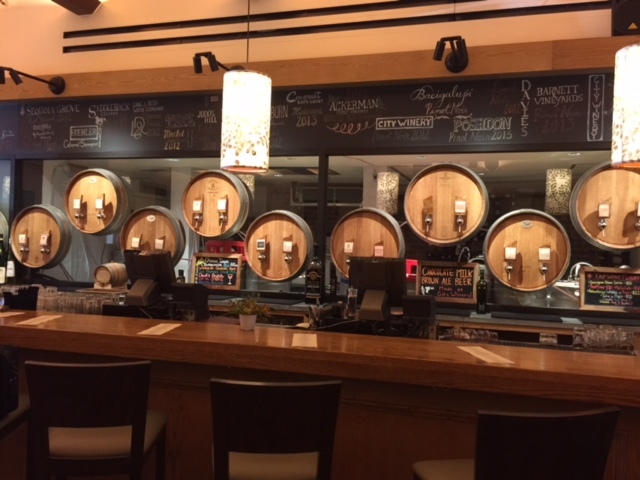 The bar features 35 wines on tap including 30 sourced from local vineyards and wineries and an extensive wine list. They also feature private dining experiences for up to 30 people that includes a balcony that overlooks the Napa River. And if you arrive to the show too late to have dinner, you can order food and drinks from the concert venue with no reservation required. The City Winery pairs culinary and cultural experiences creating the perfect setting to share your passion for wine, music and great food with friends. Their company mantra of indulging the senses with sounds, smells, tastes and views combine to create a unique and special experience! 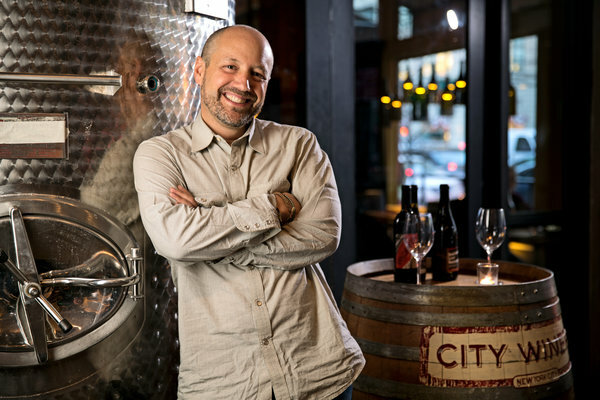 Michael Dorf, the founder of the iconic Knitting Factory – one of New York’s longest running music venues – is the brainchild for City Winery. After he and his brother Josh made their first barrel of wine with winemaker David Tate of Barnett Vineyards, Michael was hooked. He grew from drinking wine, to taking classes, attending wine dinners to finally working with grapes and creating his own wine. In 2006, this experience led to the conceptualization and City Winery was born! I just cannot say enough great things about my experience with Chef Panarello, his food and his amazing service to his customers. It was truly one of my best dining experiences. This is by no means a vegan restaurant – fish, meat, poultry and cheese are still the stars of his menu. But I can guarantee that he and his staff will welcome you and provide you with an amazing vegan experience. Be sure to mention to your server that you are vegan and Chef will make a masterpiece just for you based on the fresh ingredients he has in his kitchen that day! And be sure to mention that you heard about him and the restaurant on my blog. I know he and Bevin will love to hear that! I’m certain that you will enjoy your experience as much as I did. Thank Chef Panarello for being so creative and vegan-friendly and as always…eat, drink and be vegan! This Tin Barn is Animal (Product) Free! Napa Valley Vegan's Roadtrip to Capitola! We are coming to Yountville & Windsor in couple of weeks. Do you have a list of more vegan-friendly restaurants in the area anywhere on your blog? Thanks! Thanks for reaching out! I haven’t spent much time in Windsor though I believe there are some great options in the Windsor/Santa Rosa area. On my blog, choose casual dining & fine(r) dining as your Category option & all the restaurants I have visited to date are listed. I am in Northern Michigan for my sister’s wedding now but will put together a list of choices in both areas and message them to you! Welcome to Napa Valley! I am so excited to hear about the vegan options at City Winery! My husband and I will definitely be going. All of the dishes sound delicious. Thank you Joe Panarello for brining more vegan options to Napa.